If you are like me, nothing makes you feel better at the end of a rainy, dreary day than a bowl of chicken soup. I really love a traditional, herb-y, vegetable-laden chicken noodle soup, but when I feel like I need a little boost to my immune system, I turn to more pungent flavors. Having just started a new job, I feel like I am exposed to a whole new set of germs! With all the talk of the flu and vaccines, I can’t help but feel like I need to do all I can to combat the forthcoming winter nasties. Whether or not there is any clinical truth to these ingredients improving your body’s ability to fight off sickness, I know that the following things just make me feel better after eating them in a big piping bowl of chicken soup: garlic, ginger, chilis, star anise, cloves, and chili sauce (like sriracha*). Beyond these flavors, I (obviously) like some chicken (white meat, dark meat, or a combo) and whatever fresh vegetables I can find. For the most part, I tend toward more Eastern-inspired choices like those in the version shown in the picture. Shiitake mushrooms, baby bok choy, thinly sliced carrot, baby spinach, and pea shoots (which I used as garnish). As for noodles, I think you should choose something hearty, like buckwheat soba noodles (if you can find them) or whole wheat spaghetti (broken, if you like), instead of the traditional egg noodles. As for the method of creating the soup, I basically heat oil (olive, canola, safflower – whatever you have) in a soup pot and then brown the chicken in it on both sides, seasoning with salt and pepper as I go. You don’t have to worry about cooking the chicken through at this point, since you will cook it again in the broth. Once you have the chicken nicely browned, remove it to a plate and reserve. In the same pot, quickly saute your garlic (pressed), ginger (diced), and chilis (sliced; Thai, Jalapeno, Serrano – whatever you can find), adding more oil, if necessary. Once these ingredients begin to soften and are very fragrant (the chilis might choke you a little! 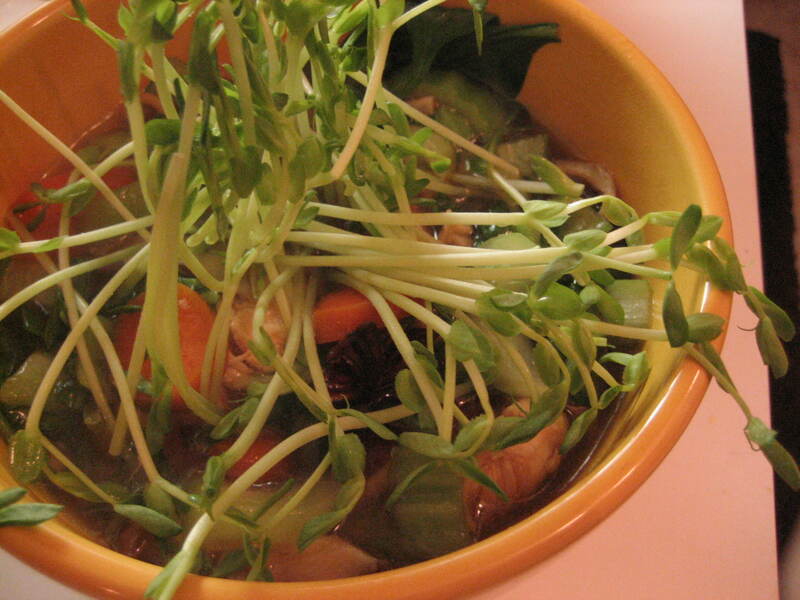 ), you can start building your broth. Add about 6 cups (or more) of chicken stock to your pot and bring to a simmer, adding two star anise, a few Szechuan peppercorns* (if you have them), three whole cloves, two tablespoons of soy sauce, a tablespoon of nam pla* (fish sauce), salt and pepper to taste. Simmer these ingredients for as long as you can to develop a rich-flavored broth. If you don’t have a lot of time, don’t worry – the flavors develop pretty quickly. At this point, I cut the chicken into bite-sized pieces and return it to the broth to finish cooking. This is also a good time to get your vegetables ready to go into the soup – basically, I just clean and chop everything into similarly sized chunks. Once you have them all prepared, your chicken should be done and you can add the vegetables to the simmering broth. For me, I like my vegetables with bite (not mushy), so I don’t let them cook for very long. Just be mindful that things like carrots and celery are going to need more time than something like spinach or cabbage, so you can stagger your additions. Regarding noodles, I always use a tip that my friend Christine taught me and cook them separately, adding them to the bottom of the serving bowl just before I bring it to the table. This keeps the noodles from becoming too soggy in the broth. So, once your vegetables are done to your liking, dish up the soup over the noodles, mix a little bit, and serve! You’ll be feeling better in no time!